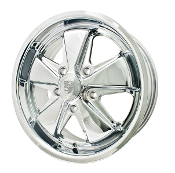 "Wide 5" wheels are 5 lugs on 205mm bolt pattern. They came on many VW's 1967n & earlier, buses to 1971, and on Type 3's before 1965. They require 12mm lug bolts and/or lug nuts on all VWx except buses, which require the larger 14mm. 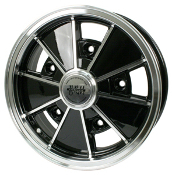 The standard 4 lug wheels on 130mm bolt pattern came on many VW's from 1968 and later, and on Type 3's starting in 1966. They require 14mm lug bolts and/or lug nuts. Porsche pattern wheels have a very favorable offset for VW's of all wheels, which is why they've been such a popular upgrade. These have the standard 5 on 14mm lug pattern. Porsche style wheels take special 14mm ball seat lug nuts/bolts. 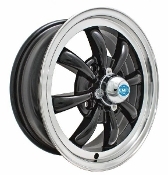 Here you'll find all the hardware and parts related to our wheels and their installation.